Does the cost of or time needed for lawn maintenance get you down? Here's the solution! NoMow! A flowering lawn that needs NoMowing and little if any water! NoMow features a mixture of miniature flowering plants together with a low growing hardy grass. Plant NoMow as a substitute for your water-loving lawn. 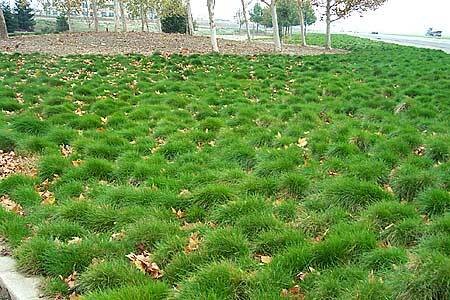 Plant NoMow as a border to your existing lawn. A breath of color, together with the soft green texture of fine grass, all of which grows no higher than your ankle! What a refreshing change to the formally labor-intensive, water-loving lawn. 5 lbs. NoMow 5000 sq. ft. coverage $59.95 Save 20%! NoMow contains miniature English Lawn Daisy, Carpet Alyssum, Baby Blue Eyes, Red Yarrow, Dwarf flowering clover, Dwarf fine leafed grass, and other herbaceous plants. It equals a New England meadow, laced with splashes of color here and there. A great spot for a picnic, a photo, or just a place to relax with a good book!